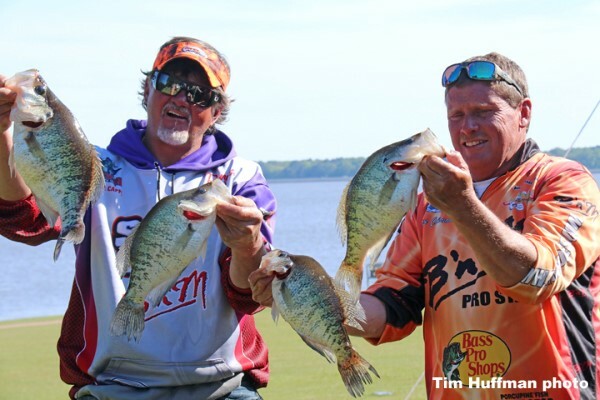 Stained to muddy water greeted the American Crappie Trail anglers at Ross Barnett Lake (better known as The Rez). Surface temps ranged from the high 50’s to very low 60’s. The water was rough both days with Friday being better than Saturday with 12 to 15 mph winds out of the southeast creating white caps on the lake taking away some of fishable water. The winds didn’t seem to hamper the top teams’ efforts. 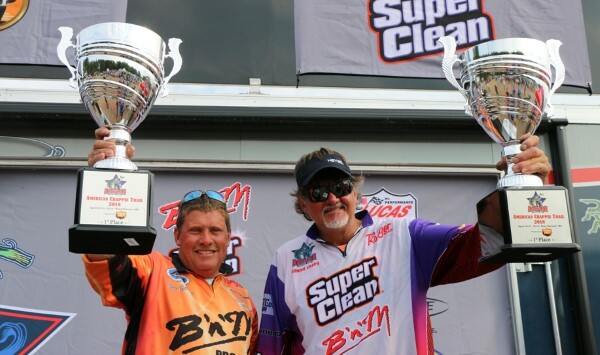 Ronnie Capps and Steve Coleman led wire to wire to take the win catching 28.16 pounds. They found a spawning area in the mid to upper lake that was 5 feet deep, hard bottom, and laden with stumps and lay-down logs with muddy to stained colored water. Using 14’ B”n”M BGJP trolling poles, they used a single Ronnie Capps signature Pro Built jig (prototype jig to be released in a couple of months) rigged with either a blue/purple Mid-South tube or Crappie Magnet. These lures were tipped with a wax worm. They felt the scent of the wax worm was a major key to getting the bites in the stained water. They spider-rigged their baits 3 ½ to 4 feet deep while only moving inches at a time and sometimes sitting still for minutes. 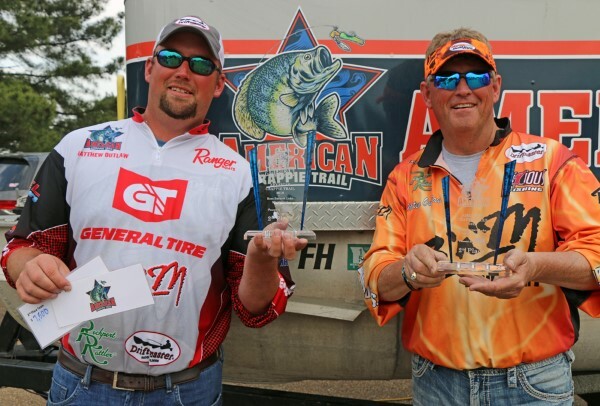 The second place father-son team of Whitey and Matt Outlaw fished along the Pearl River targeting ledges 8 to 18 feet deep. They caught 27.40 pounds. The team spider-rigged double bait rigs on top of the ledges close to the bottom. Four poles were rigged with just minnows and the other 4 poles had both a Rockport Rattl’r and Whitey Outlaw signature Pro Built jig (to be available in May). The jigs were rigged with pink-chartreuse Crappie Magnets or black/pink Mid-South tubes. Small minnows were used on all hooks for a better hookup ratio with the small baits. They moved very slowly over stumps and logs lying along the ledges, most of the time as slow as 0.25 mph. The team of Tim Eberly and George Parker finished in 3rd place with 27.08 pounds. They found their fish in two different areas. One of the areas was along the Pearl River above the highway 43 bridge with ledges from 4 to 12 feet deep laden with stumps. The other area was a mid-lake hump that was 9 feet deep with stumps and surrounded by 18 feet of water. They spider-rigged Skipper jigs rigged with green-chartreuse Strike King Jokers tipped with small minnows. Slow movement was a key factor and they used both Power Pole Paddles and dragged a logging chain to stay slow on the lake. The general consensus of all teams was that many of the black crappie had spawned while the white crappies have yet to spawn. The majority of white female crappie that was weighed showed bellies full of eggs. Big fish of the tournament was caught by the Capps/Coleman team weighed 3.01 pounds. Morgan says his 52 team draw at Neely Henry was not unexpected since it is further away for many of the teams, but he wanted to bring something closer to the eastern teams. Plus, it introduced his trail to new teams in the Carolinas and Georgia. “Ross Barnett is on my list of the top three lakes in the country,” says Morgan. “It receives heavier fishing pressure than it did ten years ago and fishermen are more efficient and skilled now with the addition of better electronics. So the number of really big fish may be down, but the overall numbers of fish here is incredible and a limit can include several fish over two pounds. There are a lot of fish over 2.25 being weighed in with several over 2.50 pounds and at least one over three pounds on just the first day here. “The lake doesn’t have a length limit and it has a creel limit of 30. Changes come slow but this is a lake that would probably benefit greatly with some limits like Grenada and other big fish lakes in the state. It’s always a balance between what a lake needs verses the economic impact and resistance that a change might bring.